Want to know who will win today? In Today’s Dream11 Fantasy Cricket Prediction MI vs KXIP 50th T20 Match IPL 2018, we will cover playing 11, pitch report Wankhede Stadium, Mumbai, toss prediction. We will also cover players recent and past performance, all the latest news and updates of Mumbai Indians vs Kings XI Punjab, dream11 guru prediction, the best choice for captain and vice-captain, weather report of Mumbai, dream 11 best team, where to watch live match of KXIP vs MI and details of live streaming. All the details and statistics that we provide are taken from very reliable sources. Make sure to read the complete post to get 100% benefit. Read all the sections of this post as every section contains some tips and tricks to win in any fantasy leagues. All the details in this post are absolutely free of cost. You don’t have to pay a single penny for that. Where Can You Watch the Live Streaming of MI vs KXIP or Channels to Watch? Who Will Win the 50th Match of IPL 2018 Between MI vs KXIP and Toss Prediction? What is the best combination of players for Dream11 in 50th Match? 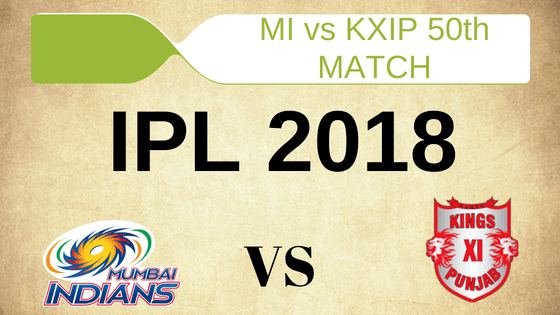 Match: Indian Premier League, KXIP vs MI, IPL 2018. The pitch of Mumbai, Wankhede Stadium is a batting beauty. It has a good bounce on it and the batsmen can trust on the bounce and can play straight shots. They can also play on the rise shots easily as the wicket has even bounce. The seamers also get some benefit from the pitch. Today fast bowler will get some swing in the initial overs if they bowl at the right areas. We can expect a high scoring match on this ground. The average first inning score of this ground is 187. The average second inning score of this ground is 183. Highest total on this ground is 230/8 in 19.4 overs by ENG vs SA. Lowest total on this ground is 172/10 in 20 overs by AFG vs SA. Sunny, Sunny and mostly sunny. This is how the weather will be of Mumbai on 16th May, throughout the day. The sky will be clear and no rain is expected today. The cricket fans and fantasy users can see the complete match. The temperature is expected to be 30-Degree Celsius and humidity to be 78%, which may rise up to 80%. In the latter half of the game, dew is expected. In the last five matches, MI won three matches out of five matches whereas KXIP won two games out of five games. In overall encounters, MUM won 11 matches and PUN won 10 matches. At this venue, Mumbai Indians won three games and Kings XI Punjab won four games. Star Sports has paid a huge amount of INR 16,347.50 Crores to get exclusive rights of IPL 2018 for live coverage for five years starting from 2018 to 2022. Star Sports has all the media rights including TV and all Digital Rights. You can watch the full match of Kings XI Punjab vs Mumbai Indians, 50th match on Star Sports. In this section, we will provide you with the squad of Mumbai Indians vs Kings XI Punjab. Ravichandran Ashwin (c), Aaron Finch, Lokesh Rahul (wk), Pardeep Sahu, Chris Gayle, Yuvraj Singh, Manoj Tiwary, Karun Nair, Mujeeb Ur Rahman, Mohit Sharma, Marcus Stoinis, Mayank Dagar, David Miller, Mayank Agarwal, Akshdeep Nath, Axar Patel, Barinder Sran, Manzoor Dar, Andrew Tye, Ben Dwarshuis, Ankit Rajpoot. Ishan Kishan (wk), Rohit Sharma (c), Krunal Pandya, Suryakumar Yadav, Mitchell McClenaghan, Sharad Lumba, Evin Lewis, Aditya Tare, Hardik Pandya, Pradeep Sangwan, Adam Milne, Ben Cutting, Saurabh Tiwary, Tajinder Singh, Jean-Paul Duminy, Jasprit Bumrah, MD Nidheesh, Mustafizur Rahman, Mayank Markande, Siddhesh Lad, Anukul Roy, Kieron Pollard, Akila Dananjaya, Rahul Chahar, Mohsin Khan. If Mumbai Indians loses today’s match, they will be out of the tournament. On the other hand, Kings XI Punjab may get a chance to play in the playoffs if they lose the match on Wednesday. However, both the team will definitely want to win the match. It will be interesting to see how MUM and PUN make their playing 11 combinations. We will provide you with the playing 11 in the next section. At this stage of the tournament, MI cannot afford to lose the game. They are in a do-or-die situation. If they want to win, Rohit Sharma has to strike today. The only change MUM can think of is to bring Pollard in, in place of JP Duminy as they find it difficult to use Duminy. Except for this change, MI should play with the same playing 11. Evin Lewis, Rohit Sharma (capt), Hardik Pandya, Ben Cutting, Mitchell McClenaghan, Mayank Markande, Suryakumar Yadav, Ishan Kishan (wk), Krunal Pandya, JP Duminy/Kieron Pollard, Jasprit Bumrah. Kings XI Punjab had a great start at this season of IPL but after they returned back after a week’s break, they lost their momentum. They lost 4 matches out of five matches. They have heavily relied on their top-order batsman and their middle-order batsman failed continuously. If they want to win their middle-order have to perform today. KXIP can make a couple of changes in their team. If Mujeeb Zadran is fit to play then he will replace Stonis. Yuvraj Singh or Manoj Tiwari may get a chance in place of Mayank Agarwal. Chris Gayle, Karun Nair, Marcus Stoinis/Mujeeb ur Rahman, R Ashwin (capt), Mohit Sharma, KL Rahul (wk), Mayank Agarwal/Yuvraj Singh/Manoj Tiwari, Aaron Finch, Axar Patel, Andrew Tye, Ankit Rajpoot. Pro tips: Both the wicket-keepers are in good form. You can take anyone on your team. Try to keep KL Rahul in your team. Make a combination of the above players for multiple teams. Pro tips: The above batsmen has a good chance of performing in this match. Make a combination of the above players for multiple teams. Pro tips: Make a combination of the above players. The right combination can make you a winner in the grand league. Pro tips: The above bowlers are most likely to take wickets. Make a combination of the bowlers for multiple teams. You can also take bowlers from playing 11. Pro tips: The above players are most likely to perform today. You can take them as a captain and vice captain. You can also take captains from playing 11. Kings XI Punjab will get 2 points and will go to 14 points. It will make things easier for KXIP. MI is on a do-or-die situation. They have to win this match as this is the last chance for them. Both the teams will give their best to win today’s match. As per the cricket experts, MI will win the match but according to our astrology prediction, KXIP will win. The team winning the toss will love to bowl first as defending a total is very difficult on this ground and dew will also come into the play at the latter half of the match. According to our astrology prediction, MI will win the toss and ask KXIP to bat first. Suryakumar Yadav is one of the top scorers. Try to keep him in your teams. Ben Cutting can contribute you points which can make or break. Try to pick players who are consistent. KL Rahul, Chris Gayle, Suryakumar Yadav can give you maximum points. Our astrology team has predicted that Rohit will strike today. Conclusion: This is it for Today’s Dream11 Fantasy Cricket Match Prediction of MI vs KXIP, 50th T20 Match, IPL 2018 which will be played on Wednesday 16th May. You can give your valuable feedback in the comment section. Subscribe to our notification of latest updates. GOODBYE! Superb website, good at predictions ??? ?